SHARON, Pa. – Mike Sakony has a personal connection with The Landing beyond the 4,200 square feet of space Blissed Out Design occupies there. The company, which he founded with Linda Smiley, moved about three years ago into the former Westinghouse Electric Corp. plant in Sharon, Pa., but his family history with the industrial property goes back much further, he says. His great-grandfather was a foreman at the plant and his grandmother worked there as a secretary. Blissed Out Design is among a handful of tenants who lease space in The Landing, which occupies about half of the 58-acre former Westinghouse property along Sharpsville Avenue. Westinghouse operated the plant from 1922 until its idling in 1985. For most of that time, it made transformers, but during World War II the plant turned out torpedoes, at one point reverse engineering a captured German torpedo that was brought to the plant. Valley Shenango Economic Development Corp. is repurposing the long-idled property to make it a community asset. “As a board, we’re really excited and trying to figure out what we can do here,” says Clancy Atkinson, president of Valley Shenango Economic Development Corp.
Valley Shenango entered into a master lease agreement for about 600,000 square feet – approximately half – of the shuttered industrial site from the Winner Companies, which bought the Westinghouse property in the 1990s. “We thought it was a good idea to transfer control of the property over to a nonprofit corporation to get some fresh faces, some younger people involved in redeveloping the space,” says Jack Campbell, vice president of Winner Development. Mike Sakony and Linda Smiley, owners of Blissed Out Design, say they were attracted to the history of The Landing. The Landing comprises six office buildings that range from two to four floors and three industrial high-bay areas with 100-ton overhead cranes. Thus far, $3.2 million – including a $3 million Redevelopment Assistance Capital Program grant from Pennsylvania – has been spent for interior demolition and renovation, roof repairs, paving and utilities, Atkinson says. A new entrance to the property from Sharpsville Avenue is slated for completion this spring, which will open access to roughly 60,000 square feet of space. “The bones are phenomenally strong,” Campbell says. The building is made of concrete and steel, and the floors are more than a foot thick. 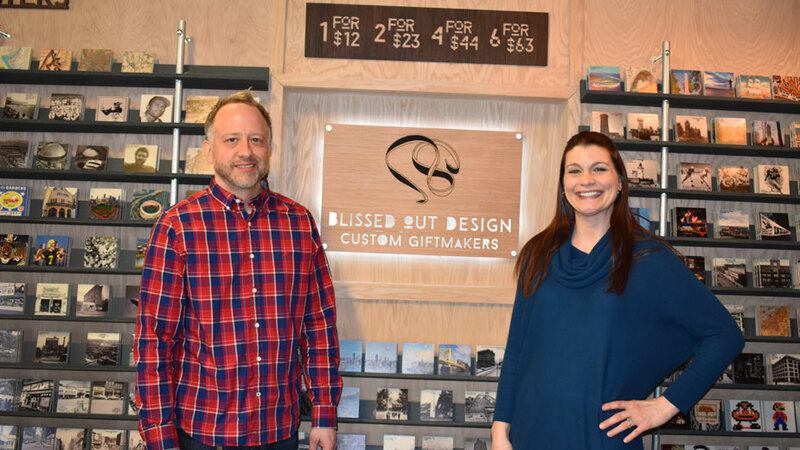 Since it opened nearly five years ago, Blissed Out Design has expanded its offerings from its signature custom drink coasters to wall art, wine stoppers, bottle openers and ornaments, Smiley says. Samples of the wall art hang in the hallway outside the production space, including a piece made using a photograph marking the manufacture of the 10,000th torpedo at the plant. Sakony, who describes the space as “basically an open canvas,” agrees the history of the building was a draw. “When we came in, I told the guys that I didn’t want them to touch anything – leave it how Westinghouse left it,” he says. 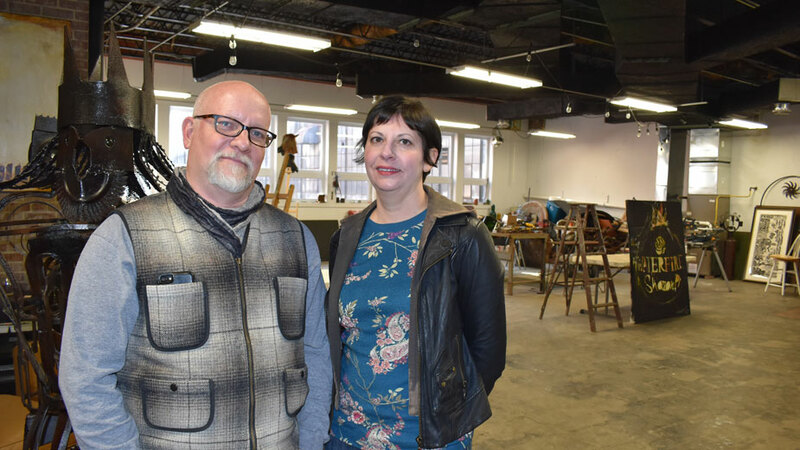 Artists Daniel Horne and Jenn Crisan have a 2,700-square-foot studio in The Landing. Horne is a sculptor who specializes in scrap metal. Crisan is a painter. The couple moved to downtown Sharon about three years ago and wanted a studio space near where they lived. Daniel Horne and Jenn Crisan appreciate the space and flexibility, they say. Other tenants include Sharon Coating LLC, which leases space for warehousing and shipping. Possibilities for the space include recreational uses such as an indoor bike park and other options for children, Valley Shenango’s Atkinson says. In addition, Valley Shenango is conducting a feasibility study for an aquaponics operation, he says, that could potentially occupy a 35,000-square-foot space on the top floor of one of the buildings. Fish would be raised for sale and the waste the fish generate would be used to fertilize leafy plants or other produce for sale to the public as well, Campbell says. He attended a three-day class in Wisconsin operated by a company that specializes in these kinds of facilities. “We ideally would like to do two phases here,” Campbell says. A commercial growing facility would provide food for sale to restaurants, grocery stores, schools or meal-kit services such as Blue Apron and HelloFresh. Some product could be set aside for the needy to be distributed through food banks or other venues. A restaurant or retail outlet also might be established within the property itself, he says. The development corporation is exploring the possibility of an educational component by partnering with Penn State University. Securing funds should encourage both private investment and the university’s involvement, he says. Pictured: Valley Shenango Economic Development Corp. is conducting a feasibility study for a 35,000-square-foot aquaponics operation at The Landing, says Clancy Atkinson.